The themes that resonate throughout Korngold’s life are particularly relevant today as they represent the fight for the very purpose of music. Is it elite, or is it populist? Is it high art or easy entertainment? Is it merely an application, like the use of colour in cinema or is it l’art pour l’art – a thing of purity and a bridge between the listener and a higher state? Is music a cultural cornerstone of European civilisation or is it merely ‘disposable’? Visit the virtual exhibition here. Fabulous and inspiring work of research ! Fascinating essay about a minor composer with brilliant gifts living through crazy times. What does that make John Borstlap? From Haas’ essay one gets the impression that Erich Korngold was a very receptive and very gifted sponge, and personally fond of overheated chromaticism, his life is painted in continuous counterpoint with the environment as if he had himself hardly any individual musical vision. And that is what most of the recordings in the essay demonstrate. He should never have dabbled in popular music, but have tried to find a conductor’s job somewhere and isolate himself with his composing into a mental world free from both his father’s and the world’s influences, and find his own reaction to the world from some inner point of strength. He could have emigrated anyway in the thirties but then as a matured composer. I never found either his symphony or his violin concerto convincing, however well-made – he poured his ninth chords, solo violins and celesta sprinkles all over the place, creating the ‘yuk’ feeling of bad taste. The story shows how difficult it is for artists of genuine gifts to be independent, both as an artist and as a practical man, and choosing Julius as his father made this extra hard. Interesting to compare Korngold with Schreker: the Schreker video in the essay shows a much more secure and structurally differentiated composer and a personality with more substance. I’m a bit amazed to see me saying this, but possibly some lessons from Schönberg would have helped Korngold with finding his own inner substance, even be it in opposition. “He should never have dabbled in popular music”………he didn’t dabble in popular music, he created music that was used in different settings with one no less valuable than the other. You really are going to have to get over this insufferable snobbery about what you have referred to as “high art” in previous correspondence about so called popular music. You will be trying to tell us next that the four gentlemen from Liverpool who revolutionised the musical world are minor musicians who have contributed little to 20th century music (and indeed one continues to write and perform). Let me guess who will still be being played in 100 years time, the music of your goodself or the music of Lennon and McCartney. And if my memory serves me right wasn’t it the classical music critic of The Times who said that the Beatles were the greatest writers of lieder since Schubert. I think that the four gentlemen from Liverpool who are supposed to have ‘revolutionised the musical world’ are minor musicians who have contributed little to 20th century music (in spite of one continuing to write and perform). But seriously… making a distinction between serious classical music and entertainment music has nothing to do with snobbery, because making the distinction does not suggest ‘looking down’ upon entertainment music. In contrary, measuring entertainment music with standards of serious art music does diminish entertainment music because it is judged with a measure that was not intended by the music. Confusing Johann Strauss’ Blue Danube waltz with a Brahms symphony does not any good to either piece, in spite of Brahms’ appreciation of Strauss and his wish to have composed the Bue Danube. There are, occasionally, elements of entertainment in serious music as there are elements of seriousness in entertainment music here & there, but that does not mean that there are no genre distinctions. Removing the framework leads to disintegration of the possibility of judgement, as your comment clearly shows. Rather than Franz Schreker, scion of an earlier generation, Korngold’s trajectory should be contrasted with that of Ernst Krenek, his almost exact contemporary (Korngold, born 1897; Krenek, 1900, and incidentally a Schreker pupil). 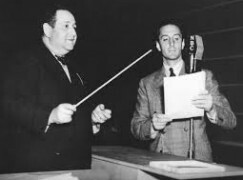 Both K’s were whizzkids, Korngold almost hailed as a “Wunderkind”; both enjoyed early modernische successes in their twenties. It is instructive to see when and where their trajectories intersected, and then diverged. Well, to quote Julius Korngold in his memoirs when dealing with his predecessor and mentor Eduard Hanslick, ‘for my generation, it wasn’t a question of Wagner or Brahms, but a question of Wagner AND Brahms’ – such are my feelings, as author of the Korngold article under discussion, and recording producer of the ‘Entartete Musik’ series, regarding Krenek and Korngold. There is ample room for both. In September, I’m very much looking forward to producing a recording which should be the first in a series of Krenek piano concertos. But Krenek has an issue that is as potentially damaging to posterity as anything Korngold can offer: he wrote a lot. Perhaps – and he hints at this in his memoirs – too much. My favourite quote of Krenek regarded an operetta he had forgotten about, and when rediscovered, wrote something along the lines of ‘it would have been better for me and the body of my work had this particular operetta remained unwritten’. As I write in my article, Krenek had already reached his opus 42 in the mid-1920s and was going strong into his 90s. He at least has the advantage of an institute that can sift through the mountain of material and a very pro-active, highly musically literate widow who can guide us. But there should be no question of either/or but a question of both and you’re right: it’s fascinating to compare because no other age could have thrown up such different, yet historically complementary figures. The entire musical panorama of the interbellum is fascinating, with its range of widely-differing composers and aesthetics. Postwar music history which conventionally projects a ‘line of development’ from Mahler, over Schönberg and Webern to Stockhausen and Boulez, is a serious falsification. It is a great thing that that period is again being ‘opened-up’, changing the perspective. For instance, the Kammersymphonie Berlin produced fascinating CD’s with Toch, Schreker, Zemlinsky and others, and occasionally digging-up a master piece like Ernst Toch’s Cello Concerto which sounds like Schönberg without frustrations. The site also offers similar treatments of Egon Wellesz; Hans Gál; Franz Schreker; Erich Zeisl and Hanns Eisler, with less detailed essays on a number of other figures. The Toch cello concerto is wonderful work and has an impressive history. Surprising that it’s fallen off the map. Indeed, if one cares for posterity, one should choose one’s widow wisely, and Gladys Nordenstrom-Krenek is the most wonderful example I know. I’d be remiss not to thank Michael Haas for producing the wonderful ‘Entartete Musik’ series, and I’m very much looking forward to the recordings — hopefully, the plural is granted — of Krenek’s piano concertos. Krenek’s zig-zag aesthetic trajectory and absorbing ‘advanced’ styles of his times, and advocating the modernist ideas of Schönberg, paint him as a less musically-gifted composer than Korngold who wisely kept to the notion of music as a language of the emotions. In the period ca. 1850-2000 the myth of ‘progressiveness’ in the arts created a distortion of the question of artistic value. Krenek found a little place in modernist music histories, while Korngold, Zemlinsky, Schreker, Toch etc. etc. went on to be ‘entartet’ for a long time, and that has nothing to do with artistic value and their contribution to the repertoire. I think the idea of what’s new being intrinsically better and more valuable has been with us for a long time. Just consider Handel complaining about the lack of Gluck’s counterpoint – essentially a complaint that the public was going for it rather than sticking to the traditional fugal, polyphonic writing of the Saxons and Hanoverians. Schubert’s admiration of Beethoven also suggests that the idea of ‘progress is always best’ has been with us a long time and is probably part of the human artistic response. It is easy to see that there is no progress in art, only change. Bach is not superseded by Mahler, Velazques not by Picasso, and Monteverdi still sounds very contemporary. Let’s see, Mahler, Puccini, Richard Strauss – all considered Korngold to be a genius. Some guy called Borstlap thinks he’s a minor composer not worth remembering. Hmmmmm – I know who I’d take notice of! I think Mr Haas is to be commended on a superb article and for assembling such incredible archive material. We are in his debt. And Mr Korngold deserved no less. Mr Haas’ essay is a fantastic analysis and period description indeed, and it is fascinating to finally read stuff about Korngold who indeed deserved better from life than he got (if we leave alone the financial rewards). But that does not make Korngold, in my opinion, a composer comparable with, say, Zemlinsky, Schreker, Ernst Toch, Mahler, Scriabine, Ravel, Stravinsky etc. etc. and that is a matter of musical substance. An opinion can be based upon correct observation, no need to become nasty if opinions differ. Apart from flashes of strong expression, in Korngold’s music they are quickly followed by sentimental gestures and kitschy instrumentation – at least, in most of the video’s as displayed in Haas’ essay, apart from the string quartet where K keeps up appearances for some time. The line between slick sentimentality and genuine tenderness is thin, but the difference is fundamental, as in real life. With due respect, but when one composer comments on another, the statements are usually idiosyncratic and even harsh. We all know what Debussy said about Beethoven or what Britten thought about Brahms’s pianoworks. Not that I think that Korngold is comparable with these four, but quite frankly I don’t give a d*** about where exactly Korngold stands in the Pantheon of composers — the fact is that he is not forgotten and at least one of his operas, “Die tote Stadt” is still being performed worldwide. The music is certainly on the level of a Richard Strauss or Puccini opera. He certainly had a rare melodic gift. I also want to thank Michael Haas for his excellent essay! It was also a great joy to hear Korngold play the piano. But I don’t see why composers should not be allowed to have their own opinion about things, like listeners, performers, critics (! ), music agents, and contributors to website discussions. There are even orchestral programmers who have particular opinions about classical music, as many taxi drivers have and if I remember well, one of them even pursued a composition career and earned more money than in his cab days. Composers’ opinions about other composers may shed a light upon the subject, and they can be right now & then. That has nothing to do with a ‘pantheon’. Debussy’s opinion about Beethoven, for instance, throws a light upon the B-cult in his times which threatened to suffocate newer and different music, and upon the numerous bad imitations of symphonic ‘developments’ which were performed respectfully. In one of his concert reviews D defended the 9th symphony against contemporary criticism, on purely musical grounds. Also other opinions of D seems to have been spot on, so I think composers – who have some inside knowledge of the art form – can offer insights as any other.